During an oral and interactive wānanga, each participant will be shown how to tune into the pounamu they are working using traditional methods including ‘takutaku’ (ancient chant). Each participant will complete the workshop wearing their taonga pounamu, having made a connection between themselves and the stone. In*ter*is*land Collective is pleased to announce two workshops with Te Kaha, Māori ‘Tohunga’ (knowledge keeper, craftsman and cultural practitioner), working with and learning about the sacred stone POUNAMU. Te Kaha is of Tūhoe and Kahungunu decent. Te Kaha is a far-travelled advocate and spokesperson representing and sharing the ancient knowledge and wisdom of his ancestors. He leads with his heart and guides in the transformation and empowerment of others. He has been carving Pounamu for over 25 years and has a deep understanding of the stone which he imparts during the wānanga. ORI SIVA URA! 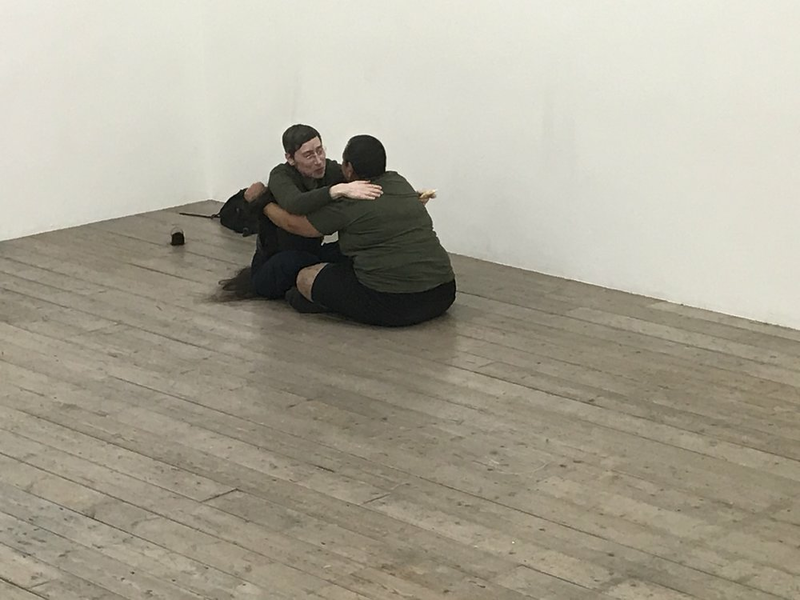 will actively explore dance from Te Moananui a Kiwa where with each hand gesture and movement stories unfold, holding history, genealogy, and culture. Spaces are limited and include a learning dance class with Beats of Polynesia, poetry readings, contemporary film screenings and a small meal. Come join us on Saturday for a warm breeze, an undulating swell and the sweet scent of frangipani. The Pacific History Association (PHA) promotes research in and the teaching of Pacific History. Established in 1980 at a conference in Martindale Hall, South Australia, the association holds biennial conferences around the Pacific. For the first time the 23rd Biennial Conference of the Pacific History Association traveled outside of the Pacific. The conference opened in London at the Royal Academy of Arts to tie into the Oceania exhibition and from there the conference moved to Cambridge for the remaining two days. In*ter*is*land Collective members Ahilapalapa Rands and Jo Walsh attended the Pacific History Association Conference 2018 through the support of New Zealand Studies Network and the Pacific History Association. The conference was a jarring mix of well established colonial rhetoric and ground breaking, innovative and archival practice from Pacific experts who had travelled to talk back to the Empire. 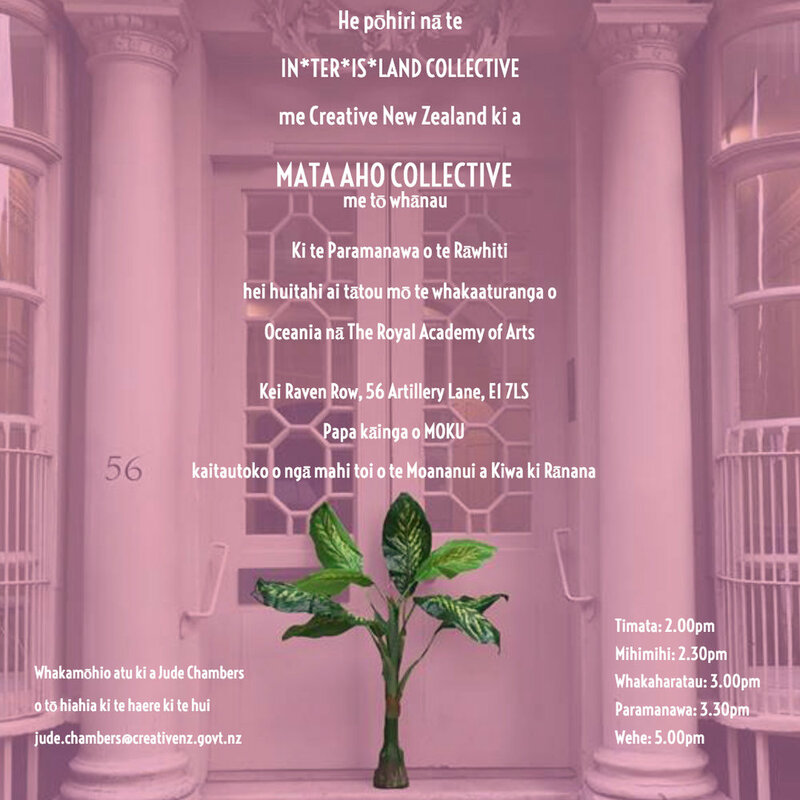 This year, Taonga and ancestral belongings from across Moana nui a Kiwa have been gathered in London's Royal Academy of Arts, on public display until December 10th, 2018. Aside from the few taonga brought over from Te Papa and the “contemporary” art pieces, many of these have been held in impoverished colonial archives here in Europe for many years. While the context that these Taonga and ancestral belongings have been brought out for is very problematic, we wanted to seize the opportunity for quality time with our belongings before they travel to Paris and are returned to the dark confines of storage. We want our taonga to hear our voices, to let them know we are here, and that we are thinking about them always. Aroha in Action was an opportunity for us to gather as a whānau, supporting each other to make offerings and responses. Over two days we went between the Royal Academy Oceania exhibition, to visit our belongings and taonga, and then return to MOKU to reflect together, while making offerings of our voices, movements and gifts. We presented our offerings as a group, standing shoulder to shoulder, in support of one another and our ancestors. For many of us the long term goal is to regain our autonomy and custody over our taonga and ancestral belongings and this moment, space and opportunity is the beginning of that journey. NB: Aroha in Action was a community action and not a scheduled event in connection with the RA programme. While we waited outside their meeting at the British Museum Maria told us of a dream she had last Monday before news had arrived that her people were coming. Shining bright and beautiful were Nunua fish but unlike in their ocean home of Rapanui they were in a river, a waterway unfamiliar to the island. 150 years ago, under the command of English navigator Commodore Richard Powell, the crew of HMS Topaze removed Hoa Hakananai’a from a clifftop along with a second, smaller statue known as Hava. Powell then gave them to Queen Victoria when the ship returned to England the following year, and the monarch donated them to the British Museum. Having spent 150 years away from its home, the statue – known as Hoa Hakananai’a –has become the focal point of a movement to return the moai which has steadily gathered momentum, when the island’s mayor, Pedro Edmunds, wrote to the museum requesting the statue’s return. November 2018 brought tangata from all over our Moana, based in the UK together. This was the first instance of Aroaha in Action a collective formed to support the people of Rapanui and other Moana movements. We stood alongside Ma'u Henua (a delegation from Rapanui) who had travelled to call upon the British Museum to return their stolen Moai ancestors. #QueVuelvaElMoai #MaytheMoaiReturn. Repatriation now British Museum your time and tired arguments are limited. Give them back the ancestors you stole. If you want to support follow Ma’u Henua, sign the online petition https://bit.ly/2qV66pg, share information via the hashtag and stay tuned as our work isn’t over. What are the dynamics of revival when cultural memory has been diminished by colonisation and accounts of the practice are translated through the positionality of academics and outsiders? Melanesian Marks is a movement to revive the practice of marking our indigenous bodies as an act of reclamation, reinscribing importance on bodies that became invisible in the colonial narrative of our existence. Curator Ema Tavola and tattoo practitioner Julia Mage’au Gray shared their personal journeys within the movement of reviving tattoo practices indigenous to the Moana (Oceania) through photos and stories. 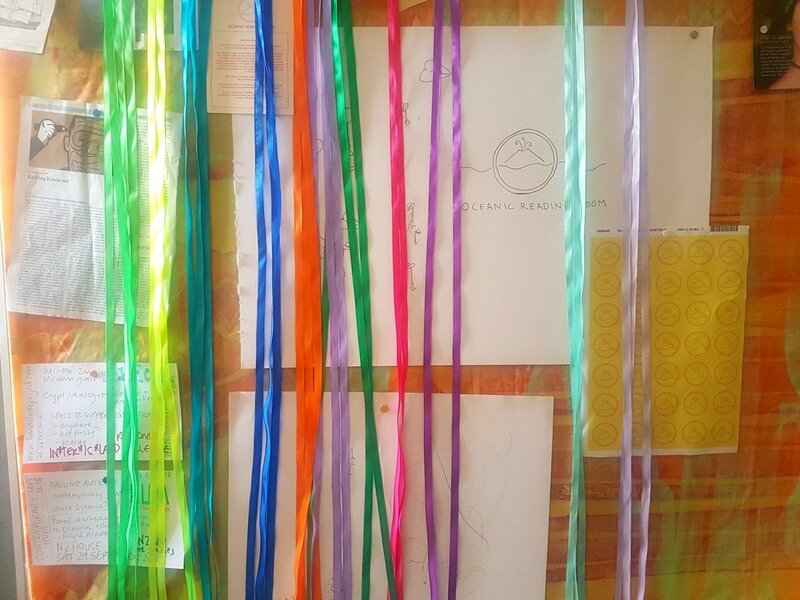 This panel was framed by a two day residency at Moku where Julia marked people in the space and the documentary following her journey, Tep Tok was screened as well as the art work The Calling. Te Moana-nui-a-Kiwa is the great ocean continent. Today, most of us think of the ocean as something that divides land and separates people. However, for those Indigenous to the Pacific (or the Moana), the sea was traditionally a connector and an ancestor. Writer Lana Lopesi’s new book False Divides explores how these connections were dismantled by colonialism and describes how imperialism in the Moana created false divides between islands and separated their peoples. The UK book launch of False Divides was held at MOKU, Raven Row in London. Lana led the session with readings from the book, followed by a panel discussion that unpacked complicated histories, reflecting on personal experience and a re-discovery of connection. The session concluded with a waiata (song) and a poem written by Vanessa Lee Miller, followed by a shared supper and more conversation. The book launch was preceded by the inaugural gathering of the In*ter*is*land Collective Reading Group, which was facilitated by Lana and covered themes in False Divides. Lana Lopesi is a critic of art and culture based Tāmaki Makaurau, Aotearoa. Lana’s writing has featured in a number of publications in print and online as well as in numerous artist and exhibition catalogues. Lana is currently the Editor-in-Chief for The Pantograph Punch and was Founding Editor of #500words. BWB Texts are short books on big subjects by great New Zealand writers. Spanning contemporary issues, history and memoir, and the series now amounts to well over fifty works. Contemporary New Zealand based Pacific Island QTIPOC collective FAFSWAG joined us at MOKU. 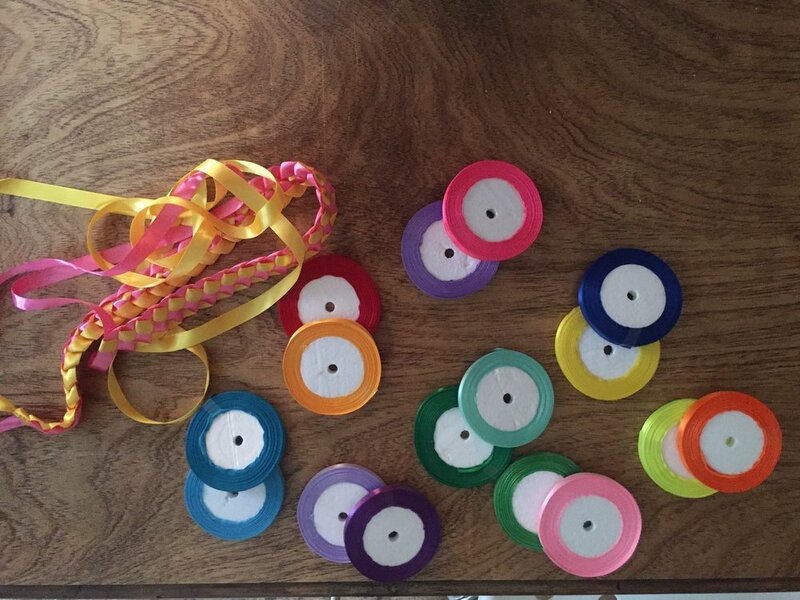 FAFSWAG is a visual arts incubator for queer indigenous creatives working collaboratively to activate public and digital space and disavow false representation of queer brown identities and bodies through creativity and self-expression. 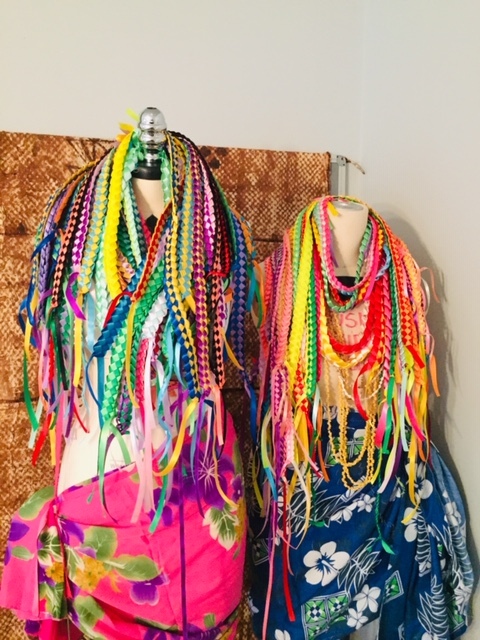 Their collective practices include filmmaking, live art, performance art, adornment and dance and in many cases, some or all of these elements are combined to produce dynamic new work that is firmly rooted in their Pacific Island community and cultures. Their most recent work is a revolutionary piece of digital immersive art. Fafswagvogue sees the elements of gaming, dance, documentary making and surveillance brought together in a 'Manga' meets 'The Terminator' world of dance battles, underground cityscapes and Polynesian culture. "Auckland is burning! So proud to support such strong artists and this beautiful part of NZ culture. I love this project so much!" The event included a screening of their new work fafswagvogue.com, followed by a panel discussion focussed on the making of the new work, their collective art practice and what the future holds for them as contemporary Pacific island artists. 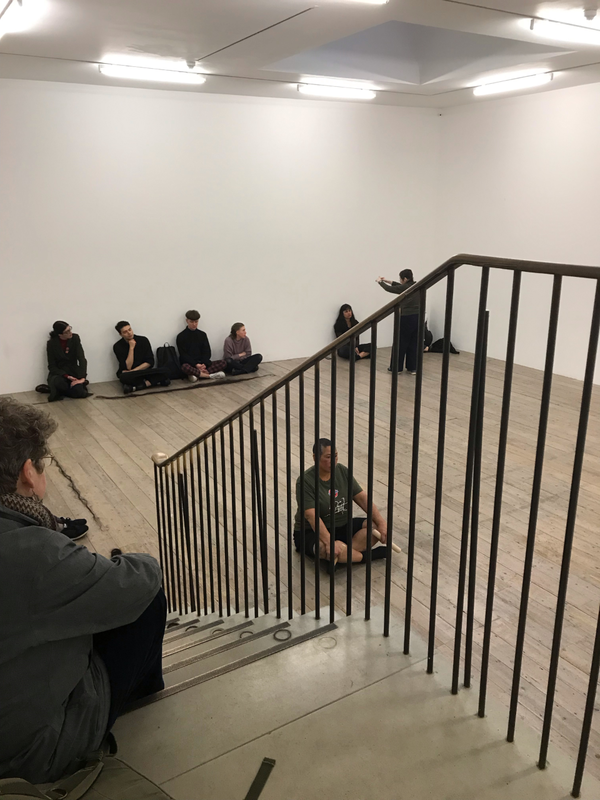 Coinciding with the opening of the Oceania exhibition at the Royal Academy of Arts in London, publishing platform Contemporary HUM hosted their second public panel discussion Whose Oceania? The discussion was designed to provide a space to respond to the exhibition outside the confines of the institution. Invited UK based, historian and Beit Professor of Imperial and Commonwealth History at Oxford University, James Belich, Curator Mātauranga Māori at Museum for New Zealand, Te Papa Tongarewa, Matariki Williams, co-chair Lana Lopesi, Art Critic and Editor-in-Chief of the Pantograph Punch and HUM’s editor Pauline Autet, brought their own analysis and complicate narratives presented within Oceania. We were very grateful that this panel enabled us to spend time with, connect and host Matariki and Lana during their visit to London from Aotearoa. In March 2018, the British Library commissioned New Zealand Māori photographer, Crystal Te Moananui-Squares (Ngāti Hako) and New Zealand Māori producer, Jo Walsh (Ngāpuhi) to create Tūhuratanga: Voyage of Discovery in response to the exhibition James Cook: The Voyages. The series of images depict people of Te Moananui a Kiwa (The Pacific Ocean) living in the United Kingdom today and are a celebration of the strength drawn, and love shown for, the diverse cultures carried from Aotearoa New Zealand, Cook Islands, Niue, Wallis & Fortuna, Samoa, Fiji, Tokelau, Tahiti, Marquesas and Hawai’i. Each portrait navigates ideas of identity and connection to the Pacific and is a contemporary response to the legacy of James Cook and the images and illustrations depicting cultures encountered on the historical voyages and shown in the exhibition. Both Crystal and Jo relished the opportunity to work with the community of Te-Moananui-a-Kiwa to photograph and celebrate the uniqueness, success and contribution of people from their own Pacific heritage and to create a positive narrative for generation of Tangata Moana (people of the Pacific) in the present and for the future. 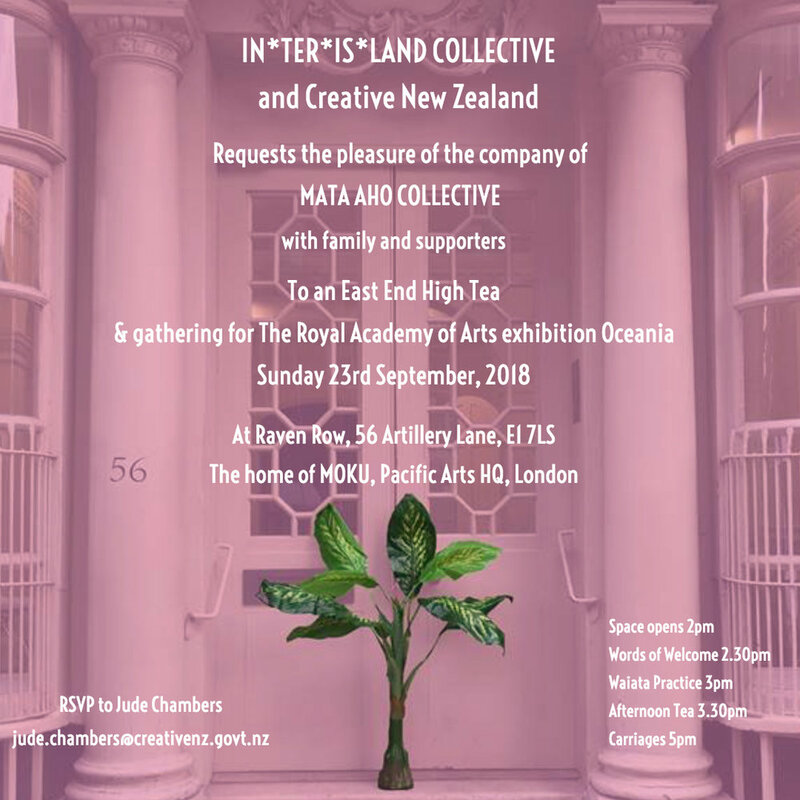 Acknowledgements: Apolonia and Luka, Bernadette and the Mackenzie / Wallis and Futuna mob in Kent, Aria Te Moananui Squares, Ariana Davis, Ataraiti Waretini, Beats of Polynesia, British Museum, Charlie Panapa, Hanalee Rainbow Fish Vaike, Horniman Museum, Jerome Kavanagh, Jess, Justeen, Gavin, August and Grayson, Justin Walsh, Joy Winitana Fenikowski and Deli Winlock, Katrina Igglesden, Lara Fields, Lauren Blissett, Lianne Unasa, Lilyanne Suka-Orme, Lyall Hakaraia, Momoe Tasker with Temu and Ari, Regan O’Callaghan, National Maritime Museum, New Zealand House, Ngati Ranana, SaVAge K’lub & Rosanna Raymond, Shakaiah Perez, Shaye Laree, Sheryl and Lt Com. Zia Jones RNZN, Sofara Aiono, Tash Vaike, Te Rangitu, George, Te Ahi, Kowhai and Pare-Ata Netana in Suffolk, Tupaia, Vanessa Majoribanks, Herewaka, Hinetera and Hariata, Willow and Tony, Dame Anne Salmond (Trial of the Cannibal Dog – Captain Cook in the South Seas), Whaea Esther. British Library, Emma Tutton, Laura Walker, William Frame, Geraldine Kenny, Alex Whitfield, Alice Carter, Jean-Philippe Calvin, Jamie Andrews, Stefan Bouchareb.